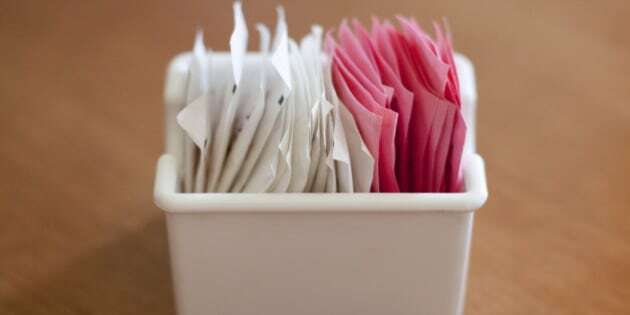 A container of sweetener and sugar packets on a table. The typical Canadian diet is pretty sweet, these days. We eat about 26 teaspoons of sugar a day, thanks in part to our increased consumption of processed foods and on-the-go lifestyles. Sugar isn’t all bad, of course -- it exists naturally in many foods, and it’s a type of carbohydrate that helps give us energy. There’s nothing wrong with indulging your sweet tooth, but there are now many ways to do that; choose what works best for you! Many coffee shops make low-sugar or no-sugar versions of their popular beverages, and you might not even realize it. Hit the chain restaurant websites and chat up your barista, and your new regular order may please you even more than that one time they spelled your name correctly on the cup. Tomatoes are good for you, right? Not when they’re loaded with sugar, as you’ll find in tomato-based sauces. Spaghetti sauce has 8-10 g of sugar per half cup, making that never-ending pasta bowl feel like a never-ending sugar rush. Asian sauces are major offenders too, so keep that in mind before you pour on your favourite sauce. Yogurt is always a healthy choice that can work as a meal or a snack. Various fruit flavours of yogurts have different levels of sweetness, so choose one that works best for you. Some yogurts, such as the new iögo 0% Stevia, even get their sweet taste from stevia extract. Are you desperate for a sweet fix? Keep yourself away from the bags of Swedish Berries in the office vending machine by chewing a piece of gum. You’ll get the initial sweetness you crave, and you’ll have minty-fresh breath as a bonus. If you truly need an energy drink (50 g-100 g of sucrose, by the way) to get you through the day, maybe it’s time to kick that chemical dependency. Increasing physical activity can help get over that mid-afternoon hump with ease, and a good night’s sleep can make almost anyone a morning person. Sure, we should all drink more water, but sometimes you just need something fizzy. Try substituting your favourite soft drink for its diet version, or a bottle of sparkling water. Both make for great alternatives. Just because you aren’t pouring half a box of Frankenberry down your throat every morning doesn’t mean you’re in the clear. Take a break from the word jumble and shift your gaze to your cereal’s nutrition info. Even those nutritious-sounding cereal names can be hiding a lot of sugar. Fruit juice is a staple of the breakfast table, and smoothies have become a staple of the food court. Both are full of sugar. A whole orange itself will still have about 10 g of naturally-occurring sugar, but if you just eat the fruit, you’ll avoid the temptation to pour yourself a tumbler full of juice. And not all smoothies are created equal, so do your research to ensure the nutritious boost you’re feeling isn’t a simple sugar high. We all love those winter evenings curled up by the television, but make sure the only thing you’re binging on is your Netflix queue. Skip the hot chocolate mix -- comprised almost entirely of a certain sweet powdered substance -- and slip a teabag into your mug instead. Fruit preserves have natural sugars in them already (from the fruit), but loads more is added to keep these spreads sweet. Choose no sugar added varieties if you must, but skipping the jam altogether isn’t a bad idea either.